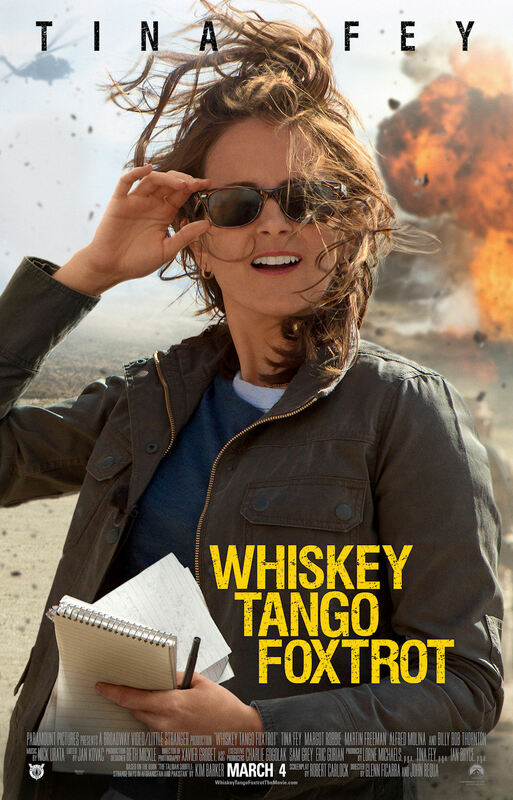 If you’re a fan of Tina Fey, and have been waiting to see Whiskey Tango Foxtrot with some anticipation after seeing the trailer, be warned! This isn’t the out and out comedy with occasional dramatic moments that the trailer makes it out to be. Instead it’s the opposite, a drama with occasional comedic moments that fit awkwardly for the most part with the movie’s main focus, the true story of one woman journalist’s stay in Afghanistan and the experiences she had there. Fey plays Kim Baker, the fictionalised version of Kim Barker (why the slight name change?). 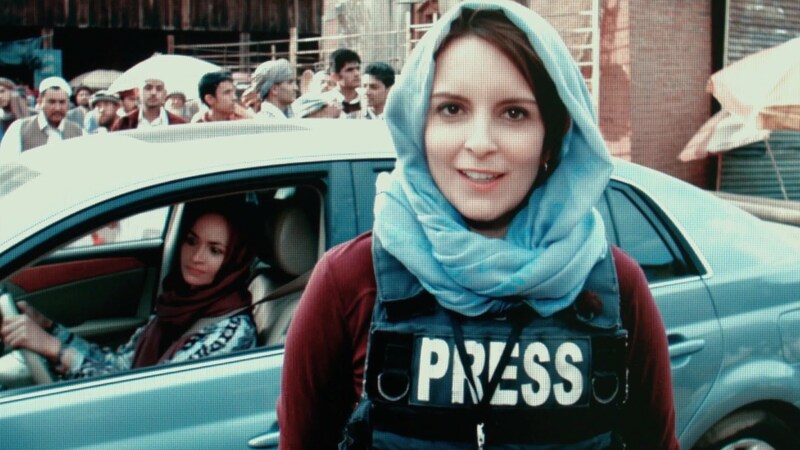 In 2004 and dissatisfied with the way her career in television news is going, she takes up the offer of an assignment reporting from Afghanistan. Taking a huge chance – she doesn’t know the language or the customs, and has never reported from a war zone before – Baker is assigned a driver/interpreter, Fahim (Abbott), and a personal bodyguard, Nic (Peacocke). She’s also grateful to find another female journalist there in the form of Tanya Vanderpoel (Robbie). At first, Kim’s inexperience doesn’t do her any favours but she soon begins to gauge the lie of the land and the feelings of the US soldiers stationed there. Her status as a woman helps her gain access to news stories that other (male) journalists and reporters are unable to gather, and as time goes by, she earns the respect of her fellow journalists, Fahim, and even General Hollanek (Thornton), the head of the US forces. She also takes risks when she feels it necessary, such as leaving an armoured vehicle when the convoy she’s in is attacked and capturing the event on video. The only downside of her experience thus far is when she catches her boyfriend (Charles) with another woman during an unscheduled video call. Barker’s story – recounted in her book The Taliban Shuffle: Strange Days in Afghanistan and Pakistan – is remarkable for how “Pakistan and Afghanistan would ultimately become more all-consuming than any relationship [she] had ever had.” Sadly, Robert Carlock’s screenplay only manages to skirt round this attachment, preferring instead to imply an unrequited attraction between Kim and Fahim that can never be consummated, and an actual relationship with Iain that sees Fey look uncomfortable whenever she and Freeman end up in a clinch. This is one of many components that the movie never finds a satisfactory place for, and the result is an uneven, sporadically effecive piece that does occasional justice to Barker’s story, and Fey’s skills as an actress. As with so many true stories adapted for the screen, the movie changes a lot, and in the process loses sight of what works best. Kim’s back story is predictably sketchy – why is she so miserable about her job? ; how did she get to a point where the idea of covering a war in a far-off country became her best option? – and it’s jettisoned just as predictably once she arrives in Kabul. The movie continues in the same vein, offering brief soundbites in lieu of solid characterisations, and making only intermittent attempts to provide motivations for the actions of its principals (when it can be bothered to go beyond the superficial). By failing to provide any of its characters with any depth – Thornton’s General is so lightweight he’s practically gossamer-thin – it becomes hard to care about anyone, even Kim. Aside from a sincere yet unnecessary subplot involving a wounded soldier (Jonigkeit), Whiskey Tango Foxtrot rarely gives the viewer a reason to believe that any of Barker’s memoir has been adapted with a view to making it appear earnest or artless. Fey’s obvious forté is comedy, and when the movie needs her to be, she’s very funny indeed. But she’s not quite so confident in the dramatic stretches, and it’s these moments that help undermine the movie further. Fey only comes across as comfortable in these situations if she can put a comedic spin on things, and the script lets her do this far too often for the audience to be comfortable as well. In support, Freeman puts in a good enough performance but isn’t given enough to do that’s memorable or fresh, while Robbie flits in and out of the narrative just enough for viewers to remember she’s there, and to remind Fey as Kim that in Afghanistan she’s gone from a solid six to a nine (so much for female solidarity in a male-dominated society). As for Molina, he plays Sadiq as a lecherous horny goat, a character two steps removed from a Carry On movie racial stereotype; it’s not quite a completely offensive portrayal, but both Molina and directors Ficarra and Requa should have known better. Despite all this, the movie is amiable enough, and under Ficarra and Requa’s stewardship makes for an undemanding viewing experience. Like Fey they seem more at home when dealing with the more humorous aspects of Barker’s time in Afghanistan (Pakistan is left out of the equation entirely), though they redeem themselves in terms of the movie’s look. Along with DoP Xavier Grobet, the directing duo give the movie a rich visual style that offers crisp compositions at almost every turn, and a warm colour palette that refutes the idea of Afghanistan as a ravaged, war-blighted country lacking in beauty. At least they got that right. Rating: 5/10 – an awkward mix of drama and comedy where neither comes out on top and where each ends up countering the other, Whiskey Tango Foxtrot isn’t as bad as it may seem, but it’s also not as good as it could have been; fans of Fey may be satisfied by her performance here, and she’s to be applauded for trying something outside her comfort zone, but there’s too many times when she doesn’t do the (admittedly) thin material any justice.